We knew the crossing would also be a battle of natural forces - and was careful from the start to respect the wind especially. Since we also had it largely from behind it is easy to underestimate the powers. 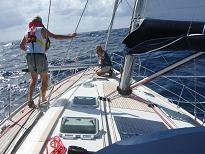 Already over the first day, we heard of people ripping sails and even turning back as they perhaps had underestimated the power of the Atlantic. 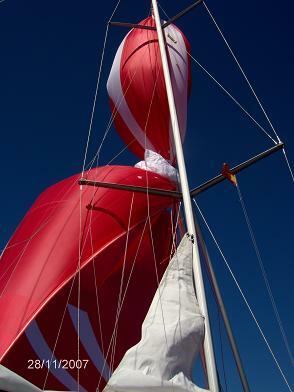 We were all proud to get the Parasailor up on day 3 - also as our spinnaker pole was new and so was the sail. It did not gain us as much speed as we wanted though, but looked beautiful. 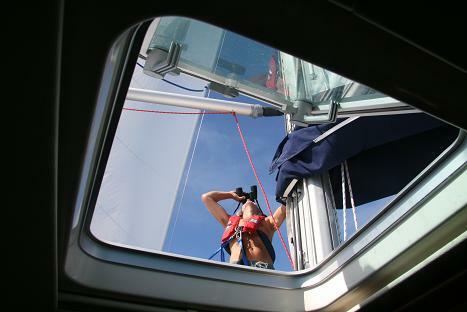 The next day, in less stable wind, it was not fun anymore with the (expensive) sail around the forestay. Yet, we got it out by turning the boat around in circles. 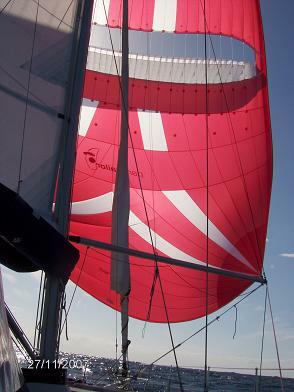 It was more dramatic though when the spinnaker boom broke in a larger wave on day 4 - and concerning. With 13 more days to go, we really depend on riding on the surf of the trade wind to go wing on wing (spre) with our genoa. Luckily nobody was upfront and the weather was good to save it. There must have been weakness in the material! The creative forces on board was more powerful than those of nature. Luckily we had extra hose clams around our heating systems (who needs it in the Caribbean) and we could tape and screw the fitting on again. A day of repairs and it was up. Jippie! 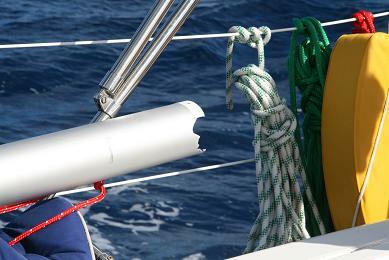 But an almost broach (rudder out of the water in a wave) the boom broke again! Yet, since then we were lucky and even pressure has held it together...even if we have often held our breath. 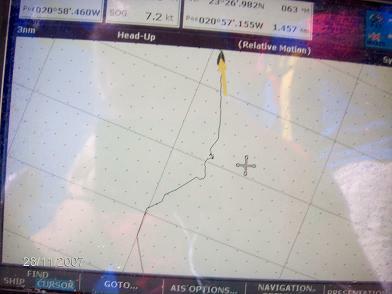 No more spinnaker though and we had lost quite some time - even detoured as the GPS showed us. Perhaps we were lucky still! The stories and accidents with the spinnakers we heard on arrival was much more dramatic: sails lost in the water, crew tangled in the rope, stuck in the mast (and somebody having to go up in the mast) and ripped in half. 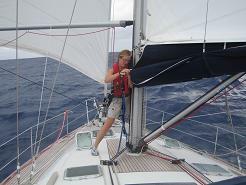 Our Lazy Bag (the sail bag for the mainsail) has been a continous weak point (Jeanneau can do better!). In even light wind, it has ripped or the x battons inside have torn the material. Regi has always enjoyed sewing, but not in this material and in the waves at odd angles. It will need more professional sailmaking upon arrival. 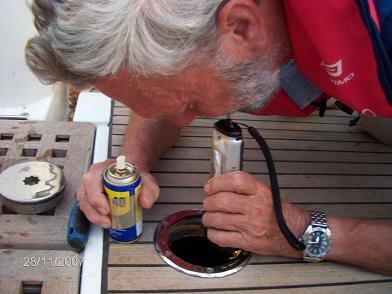 The many days at sea also took its toll in other places and required regular checks. 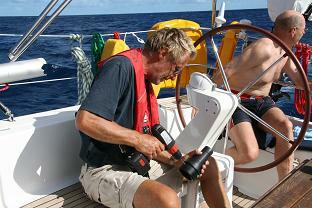 Luckily Ole has much technical expertise: here with the autohelm. We did not like others want to loose it. 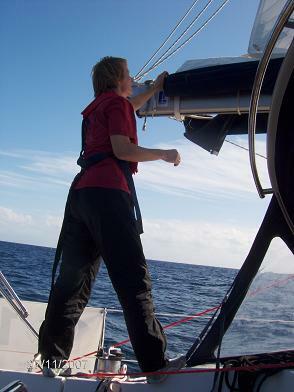 Espen does his 3 min a day rig check, incl binoculars inspection of mast.